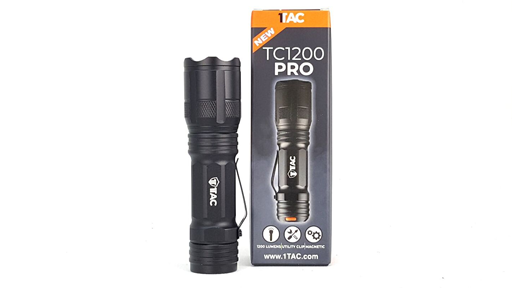 Here you’ll find information on the 1TAC TC1200 PRO the latest tactical 10 watt, high power flashlight from the most innovative brand in tactical lighting technology. 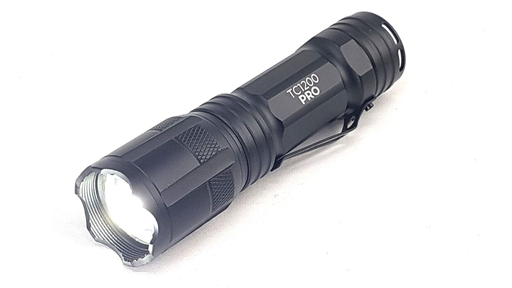 The TC1200 PRO Tactical Flashlight features a solid-state, US made CREE SM-L LED technology that generates 20 percent more maximum output than the standard XML T6. With up to 1200 lumens of blinding white light focused by a parabolic reflector into a versatile beam with significant reach and ample surround light for maintaining good situational awareness, it is crucial in any situation. 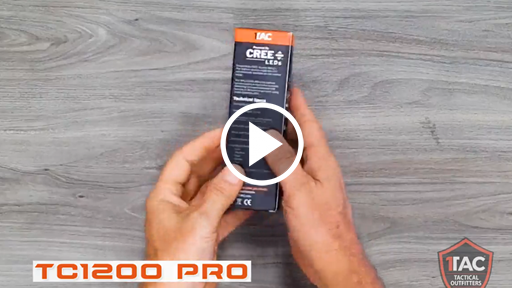 Our CREE LED flashlights are trusted by the military, fireman, hunters, outdoor enthusiasts, first responders and police officers all over the world as it’s one of the Brightest Tactical Flashlights for Sale on the market. 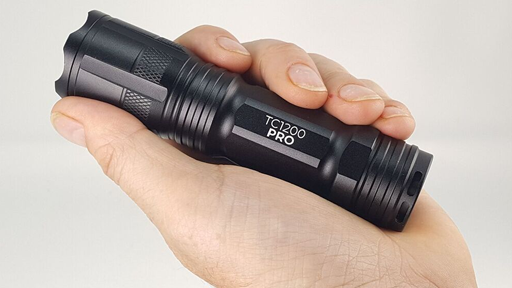 The TC1200 PRO has a powerful 5 mode, CREE LED with a sleek compact design, a magnetic base for hands free use and a built in utility clip for easy clip and go action, waterproof, lightweight and powerful and 2000x Zoom lens. 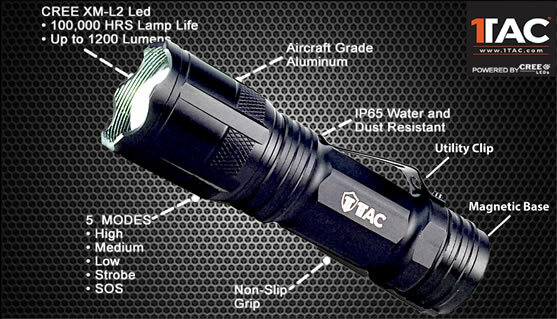 The TC1200 Tactical Flashlight is an incredible all-around all-purpose tactical LED flashlight designed for in the field use and every household and vehicle. Aircraft Grade Anodized aluminum construction and O-Ring seals mean this light is tough and reliable. An IP65 waterproofing standard protects this light against water, while its’ durable materials protect against drops, impacts, scratches, corrosion and the elements. The 5 modes of light give you access to low medium and high beam and strobe and SOS flashing. The Blinding strobe and lightly crenellated bezel provide options for self defense, making this an excellent companion for walking home at night, going to and from your car, around the house, at work or in the garage or a solid choice for a back-up light for police, security personnel and first responders. The recessed tail switch can be operated with one hand and the magnetic base allows you to hang it anywhere there’s metal for hands free use. This is an extremely versatile flashlight making the perfect device for everything from walking your dog, working around the garage, home safety to performing a tactical sweep of a building. 5 lighting modes you a variety of beam choices gives you high beam for scanning upward of 2 miles distance to low mode so you don’t blind yourself in close quarters. Perfect for reading in the tent, working around the house, garage or yard. 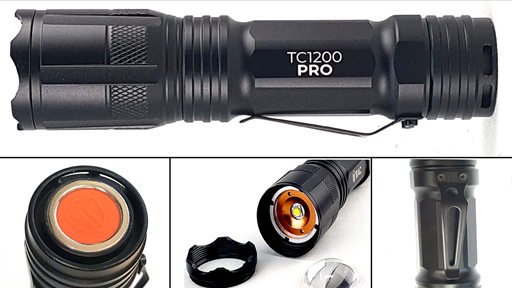 By combining the rugged durability and cutting edge design it makes the TC1200 PRO Flashlight a truly top notch, Well-rounded flashlight. At about 5 inches long, 1TAC has made this new design the perfect size for a backpack, glove compartment, or utility drawer. By combining the rugged durability and cutting edge design it makes the TC1200 Flashlight a truly top notch, well-rounded flashlight. At 5 inches long, 1TAC has made this the perfect size for a backpack, glove compartment, or utility drawer. 5 beam modes, Low, Medium, High including strobe and SOS. A lightweight, ultra high-powered Magnetic Base is built into the rear base of the case around the switch and attaches to most metal surfaces for easy hands free use. A sturdy built in Utility Clip allows you to clip the light to your belt, backpack or anywhere else you may need for easy storing when on the go.